June 21st, 2017 – The Charleston RiverDogs had some swings and some misses as they trolled the Columbia Fireflies’ most well-known player, Tim Tebow, last weekend. The Yankees’ Class A farm team hosted Tebow and his lesser known teammates, and they decided to capitalize on sold-out crowds that the former NFL quarterback drew. Starting Friday night, the RiverDogs tried out a full roster of jokes targeting Tebow’s religious and athletic history. According to stadium reports from The Post and Courier, every time Tebow walked up to the plate the “Hallelujah Chorus” played. And they didn’t stop at the walk-up songs. The RiverDogs mascot, Charlie T. RiverDog, got in on it, too. He wore black patches under his furry eyes that said “John 3:16” written in white, something Tebow became famous for wearing. Charlie T. was also spotted “tebowing,” a move where Tim would kneel in prayer after touchdowns. Joining in on the jabs were the jumbotron and the announcer. 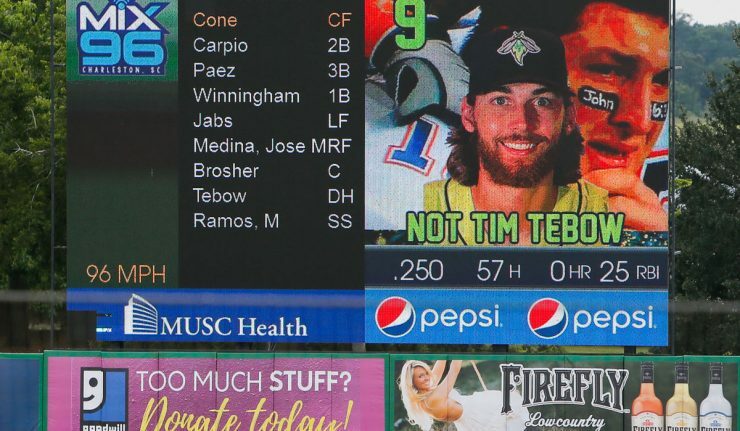 Each time a Firefly, a Class A affiliate of the New York Mets, took to the plate the jumbotron would only label them as “NOT TIM TEBOW.” Their photo was photobombed by a picture of Tebow crying after Alabama beat Florida in the 2009 SEC Championship game. The announcer “would call for a strikeout when Tebow came up to bat and encourage applause when a strike was called against him” according to Derrek Asberry who covered the game. Dave Echols, the president and general manager of the Charleston RiverDogs, has now apologized for the many stunts pulled over the weekend saying their intent was good natured. “While we believe that our promotions were poking fun at Mr. Tebow’s celebrity status rather than his religion or baseball career, our intent was not to offend anyone, and for the fact that we did offend, we are sorry,” he told The Post and Courier. Echols said that the feedback was both positive and negative and that the team worked to fix what was deemed a hurl too hard. “Of the many promotional pieces that we executed, there were a handful on Friday’s game that some construed as in poor taste, and we made it a focus to remove those elements and celebrate Mr. Tebow the remainder of his time in Charleston,” he said. That explanation wasn’t enough for some people as they saw these stunts as a direct mocking of Tebow’s faith. The outspoken Christian has put his faith on display and his defenders have sent messages of support after the weekend. Do you think this was just fun rivalry or targeting that crossed a line? FUNNY or OFFENSIVE? Vote and comment below. Tebow wouldn’t understand irony in this context. So…wait a minute…please…! So, what you are really saying is…, “There really AREN’T invisible fairies living in my backyard? Your backyard?! … Anybody’s backyard???!!!! What happened to them? Where did they ggooooo??!!! It’s because Christian’s don’t bomb markets or chop off heads…so cowards mock them all day long. Amazing how many bigots are here. . But who then defend religious tolerance for Only Islam lol. Please explain how your not a bigot lol.